The idea was conceived in 2009 when Luc Vandecasteele asked Terrence Clark could BABA (British Artist Blacksmiths Association) help organize an event to commemorate the centenary of World War One. The city of Ypres agreed to hold the event in the Grote Markt (Market Square) this is a spectacular setting for an amazing project. Twenty-five panels are to be forged at the Ypres 2016 event, each of these has been designed by a renowned international master blacksmith and depict the designer’s personal response to World War One. These twenty-five panels will be permanently displayed at the German war cemetery at Langemark-Poelkapelle, (12km from Ypres) these panels will surround a seven-meter tall weathered steel slab featuring the negative and positive image of a single poppy. The negative representing the fallen and their loved ones; the positive representing the hope for a better future that sprang from their sacrifice. A field of 2016 poppies will surround the base of the 7mtr cenotaph. These poppies were forged by hundreds of blacksmiths from around the world. The poppy is the iconic symbol of remembrance. The market square in the centre of the city of Ypres is breathtakingly beautiful, it covers an area of about 1 hectare. The magnificent cloth hall complete with a 70mtr belfry was completed in 1304. This provided the backdrop for the blacksmithing event. Many of the buildings surrounding the market square were built in a similar period. Almost all of these buildings were completely destroyed during the bombing of World War One. All of these buildings have been meticulously restored. 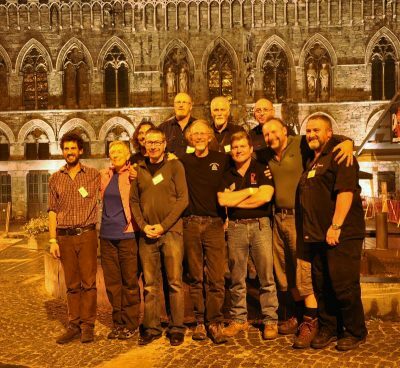 The set up for the Ypres 2016 International Blacksmithing Event was a phenomenal undertaking – I can’t speak highly enough of efforts undertaken. The setup included two 15mtr x 30mtr marquee’s positioned end to end, adjacent to the cloth hall. A third small marquee was set up for children’s forging of poppies. A comprehensive array of blacksmithing was available, items included: thirty-five anvils, thirty coke forges & eight gas forges, six power hammers, one fly press. Each marquee had two small shipping containers to act as storage as well as enclosed workshop areas for welding and grinding, plus an enclosed storage/ workshop area for materials storage and also for welding and grinding and including a TIG bay. Wendy and I arrived lunch time 1 September. The event had started early that morning. Upon arrival delegates (blacksmiths who had paid to forge) received a Ypres 2016 International Blacksmithing Event commemorative bag, a tee shirt and a pair of safety glasses. Each master blacksmith had a team of approximately 6 or 7 blacksmiths plus a forge steward. Each team was allocated two days to complete their panel, forging started at 7am each morning and finished at 7pm. The team I was involved in comprised, Achim Kuhn, Master blacksmith from Germany & only spoke German, Daniele Baudino from Italy who only spoke Italian. James Abbott, Tim Mackereth, John Sleath, Chris Wilson and myself (Kieran Gleeson), Roy Abbott was our forge steward. The remaining six all spoke English but no German or Italian. We were not the only group who struggled with a language barrier. Our panel comprised of two large panels of approx 10mm steel plate, positioned one either side, this was cut with a gas torch, we then heated these plates in the forge and forged them to a very exact look that Achim wanted. We also forged a hand out of the same plate. The hand was riveted in a central position above the top rail of the panel. A globe of the world was suspended below the hand on stainless steel wires, the globe was made prior to Wendy & I arriving. I understand there were more than 170 blacksmiths in attendance, over 20 nationalities were represented. Many comments were made on the high number of Aussies attending. From QLD: we had Troy Honeman & partner Sandy. NSW: Craig Drew, Don Gabriel, Peter Birchall, Steve Gale & wife Leonie, Colin Dray & partner Wendy, Wil Maguire & wife Ali. Vic: Bruce Beamish & wife Linda, Denise Axleson, Kieran Gleeson & wife Wendy. Children were instructed & assisted in the forging of poppies at the Ypres event. A mobile setup of this was taken to schools, clubs, museums & various shows across England, Wales, France, Belgium, Italy & Germany. Poppies made by the children have been assembled into a wreath. This wreath was laid at the Last Post ceremony on 5th September 2016, a huge crowd attended this wreath-laying presentation. We were able to combine blacksmithing and patchwork into a fabulous 5-week overseas adventure. We landed at Heathrow 27 August where we spent 3 big days exploring London plus a day tour that took us to the Avery Stone Circle, Bath and the tip of the Cotswolds. 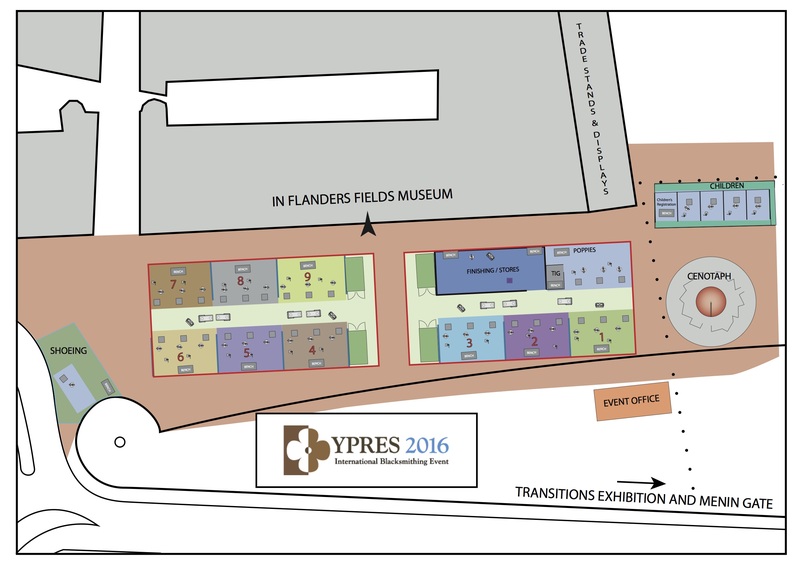 1 – 6 September: we attended the Ypres2016 event staying at the Regina hotel, located about a one-minute walk from the blacksmithing event. Several of the NSW blacksmiths also stayed at the Regina hotel. Wendy & I did quite a bit of sightseeing through the local area including a tour of many of the war cemeteries, my grandfather fought at Pasendale, 13km from Ypres. 13 – 27 September patchwork tour of France. An ironic part of the patchwork tour was – when I initially made enquiries regarding this patchwork tour, I was assured all would be ok as there are always at least 2 to 3 blokes on these trips – however on this occasion, there was only one – me! I momentarily found this to be a bit daunting, within a short space of time, it wasn’t an issue. Our patchwork tour took us to Riquewhir, Mulhouse, Avignon & Paris as well as many towns and special places throughout the regions of France that we traveled. Wendy & I had an incredible five weeks away, we saw and experienced many amazing things, we made many new friends through both the blacksmithing event and the patchwork tour. Special thanks to Henry Pomfret for an insight into the setup of the Ypres2016, Henry and his assistants spent two years planning the setup of this event.